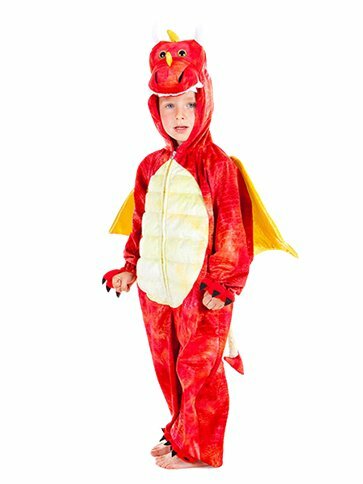 This adorable and ultra-soft, red Dragon costume features an all-in-one, bright red, velour feel jumpsuit with full zip fastener to front and attached padded, hood with impressive, cute dragon, character face. The Jumpsuit boasts all over embossed 'scaly' detail, a padded belly and elasticated cuffs and ankles with attached, claw like hand and shoe covers. This plush, Red Dragon Costume also has an attached pair of large, gold, padded wings to the back along with an attached cute dragon tail. Want it Friday, 26 April? Order it within 2hrs and 1mins and choose Premium by 9pm Delivery at checkout.